Callodhir stretched as the first light of dawn appeared over the hills beyond Lake Nenuial. The air felt heavy already as a light drizzle began to fall. He sighed. Fights against the Angmarim would be more draining in these worsening conditions, with a storm all but a certainty in Evendim today. Not that the Dùnedain had gained much ground over the last few days. But that wasn’t the main issue on his mind. “Distractions I am not accustomed to. But then, neither am I used to these conflicting emotions.” he mumbled to himself, his shoulders sagging. He turned his head and the internal confusion surged once more. She was talking with a Raven, while clearly packing her supplies onto her horse. She would want to leave quietly and quickly and the Elf would respect that. The fact he knew this day would come did little to comfort him. The Elf himself felt more tired this morning, than he had before his disturbed ‘sleep’ in the night. 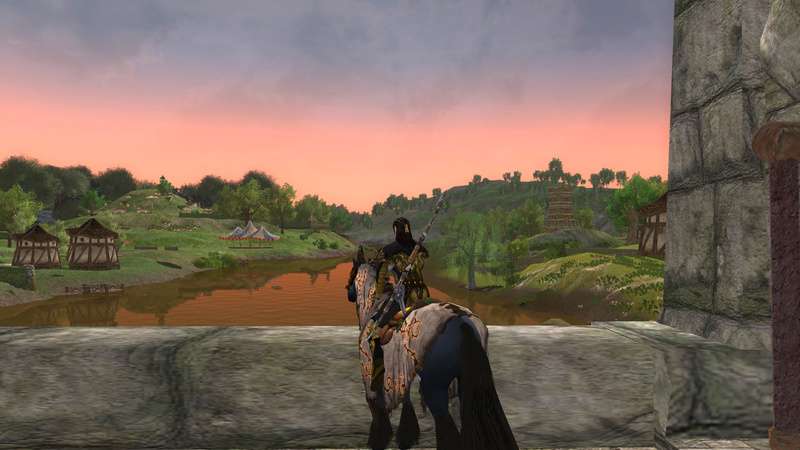 But, unlike his departure from Evendim, he had ensured he was wearing his black and yellow leather armour. He felt more prepared this time, even if his mind felt sluggish. He noticed Lamuna was also dressed more practically, sporting a light bronze-looking tunic, rather than the dress she had worn yesterday. And her sword was firmly sheathed behind her back. The Hobbit nodded and began placing meats and sweetbreads into a rough cloth bag. “I’d tell ya ta stay if tha’ wasn’t expectin’ yer to do somethin’ I ain’t willing ta do!” giggled Rubybella, rushing in and grabbing a couple of cobs of fresh bread. Aside from the still-wet, somewhat bedraggled, ginger hair from a hurried shower, she was dressed ready for work. And with that, Ruby waved, picked up her carved wooden shield that leant against the wall by the door, and hopped out into the early Shire morning. “Bree indeed!”, Lobbo complained, huffing his way to the pot of tea keeping warm over the fire. “Master Hobbit, I know we’ve not had much to agree on, but I still thank you for your hospitality. It has been really appreciated.” Caethir offered. “Well, yes, you’re welcome of course. I just didn’t envisage you taking my daughter away with you.” the Hobbit replied, not concealing his disappointment. Lobbo muttered a few things under his breath then, as politely as he could, excused himself to go and set up his market stall in Bywater. “Pay no heed to my Father, Caethir. He means well – he is just simply a very traditional Hobbit. We don’t change easily.”, Lamuna smiled, her wild, black hair half covering her face as she looked up at him. With that, they bundled the Elf’s belongings into bags and exited the Burrow, the welcoming breeze suddenly awakening their senses. Caethir took a deep breath and strode around the back to untether Gwaerrennaur. Once both the Elf and the Hobbit seemed ready they slowly made their way to the path eastward towards the Brandywine Bridge. The two spoke little, both being aware that they had bonded in the fleeting hours they had known each other and neither willing to part. As mid-morning approached, the sun was concealed behind billowing clouds and rain began to fall. “This will make an interesting first day of training with Ruby,” Lamuna remarked, as the Brandywine Bridge approached. “You’re sounding more Elvish today, but you are correct.” Lamuna nodded. “More Elvish?” Caethir glanced sideways, laughing. “Yes, speaking encouraging words of wisdom”, she clarified. They stopped at the Bridge as the rain became heavier and the Elf could feel some water splashing down his neck and back. “Please take good care of yourself, friend Hobbit.” Caethir said crouching down so they could see eye-to-eye. “And you, friend Elf. Hope we meet on a dryer day!”, she smiled. For a moment they just looked at each other, both recognising this was just the start of a long friendship. Bonds between Elf-kind and Hobbit-kind would be wrought, even though their journey would be full of perils. “You’d best not keep Ruby waiting, Lamuna.”, Caethir said, breaking the silence. Lamuna wiped the rainwater from her face and hoped the Elf would not notice that as her only motive. The Elf stood and Lamuna turned on her heels and began running back to Bywater where she would cross over her own bridge to head North and meet her cousin. The Elf climbed onto Gwaerennaur and patted his horse’s head before gently encouraging him over the Bridge. He stopped for a just a few moments to gaze South down the Brandywine, the call of the water seeming to reach to him from across the ages. With a heavy heart he urged his steed forward and crossed into Bree-land. Explore Rath Teraig, Find the Elf Ruins, Places of the Dwarves and Scout the Dourhands!